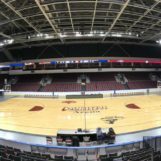 DODGE CITY, Kan. — The Dodge City Sports Commission has announced it will host the 2020 and 2021 National Junior College Athletic Association (NJCAA) Region VI Men’s & Women’s Basketball Championships at United Wireless Arena. The Athletic Directors from around the Kansas Jayhawk Community College Conference (KJCCC) met on April 12 at Dodge City Community College and voted in favor of United Wireless Arena hosting for a two-year term. “It is a great opportunity to bring fans from other schools to spend time in Dodge City. We look forward to showing everyone the great facilities we offer and hope to continue this relationship with the KJCCC in the future,” Dodge City Community College Athletic Director Jake Ripple said in a release. The Region VI Tournament will bring eight men’s and eight women’s teams to Dodge City to compete in a four-day tournament with the winner of each the men’s and the women’s advancing to the NJCAA National Tournament. The first round of the Region VI Tournament will take place on February 27 and will be at the higher-seeded team. Those eight winners will then advance to Dodge City. The tournament in Dodge City will begin on Saturday, February 29 and will go through Tuesday, March 3. The quarterfinals will be played on Saturday and Sunday, followed by semifinals on Monday and the championship games on Tuesday. The Dodge City Sports Commission hosts multiple sporting events throughout the year and is charged with accommodating to the public and staffing of those events. Upcoming events hosted by the DCSC include the NAIA Softball Championship first round, KSHSAA Class 5A State Golf and the 2019 Kansas Shrine Bowl. including 12 private suites and 150 premium loge seats on the suite level.